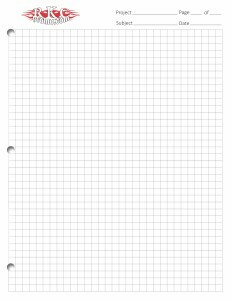 Does your business use graph pads for sketches, notes and miscellaneous purposes? Custom note pads are offset printed on 50 lb. white paper with one standard color on one side and are padded 50 sheets to a pad with a chipboard back. Additional colors are available. The sample is shown with phantom grids and 3 hole punch but those are options you may not need. This pad is also a full letter size page but they are available in other sizes. Click on the picture to see more information. Prefer a legal style pad with a top perforation? They are available with the same options and are also available in pads of 30 instead of 50 at the lower quantities. These products are great for college, office and school. Add a pen with your imprint at seminars and meetings. Add a calendar to the imprint for sales and employee meetings.